We have recently released a number of new team building activities that have added a lot of fun and energy to recent meetings. A few weeks ago, I had all of The Leader’s Institute ® instructors fly in to our corporate office in Texas. We had an absolute blast unveiling and refining some of our new team building activities internally. Now, we have released these activities for delivery to customers. We hope that you enjoy them as much as we did! By the way, if you are looking for free ideas and games, check out our Resource Center! I’m In It to Win It. We were all pleasantly surprised with how much fun this was. This hilarious game-show team activity is based on the hit NBC TV show “Minute to Win It”. If you ever saw the show, though, there was only a single contestant competing against a clock. (Not great for team building.) So we made a few changes! We started by organizing the group into small teams who competed against each other (instead of a clock). As a result, the energy and fun increased quickly. In addition, the groups began to think on their feet to organize and strategize. Out of all of the tests that we did, this one performed the best. In fact, our instructors rated this activity number one on their list of new team building activities. They absolutely had a blast when we tested it within our own group as well. The video above gives you a “taste” of the type of activities that are involved. The video was taken during a client event in San Diego. This activity is called “Face the Cookie”, and the contestants competed to move an Oreo cookie from their foreheads to their mouths without using their hands. Your group will love this program. Click here for more details: I’m In It to Win It. My Rich Uncle Team Escape Room. You may have seen a number of escape rooms pop up in your local city. These are activities where a team of four to six people are locked in a room and have to complete a series of puzzles to find the exit. The idea behind escape rooms is fantastic, but the application as a real team building activity often falls flat unless your entire team consists of only five or six people. The biggest problem with using an escape room as a team building activity is that you can really only have a small number of people in each of the locked rooms. So, if you have 10, 20, 50, or 200 people in your group, this can be a challenge. UNTIL NOW! My Rich Uncle is an activity where dozens or even hundreds of participants can have an escape room experience — All At The Same Time! For more details about My Rich Uncle, click here. My Big Fat Greek Team Building Event. Our instructors have had so much fun creating and refining this “cocktail hour” team activity. The premise behind the idea is that a few minutes after your group begins their normal happy hour program, the emcee takes the stage to facilitate an impromtu wedding reception for a bride and groom (from your group) who are in on the joke. Everyone else in the room, though, must use their wits to go with the flow as they become integral pats of the reception. The more that your group gets into the fiction, the more hilarious the results. The fun thing about this program is that it take the ordinary happy hour and makes it very interactive. Each participant has a fun, shared-experience with coworkers. Don’t be surprised if, after a few drinks, some of your most introverted associates begin to sing and dance. If anything goes wrong, don’t worry, you can just spray some Windex on it. Amazing Builders. This is the absolute most flexible charity team building event in the world. Years ago, when we first created the Build-A-Bike ® team building activity, we had no idea how big this new industry would become. As a result, we have had a number of clients who have worked with our instructors for years, so they have already built bicycles for kids, donated food to the homeless, and stuffed teddy bears for families who have experienced a tragedy. So, what’s next. 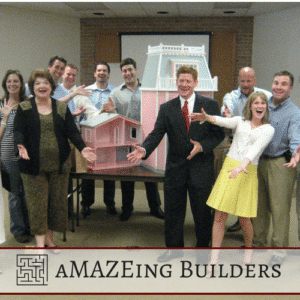 Amazing Builders (aka aMAZEing Buildiers) allows you to pick items that you want to donate to charity, and we design activities around that donation. So far, we have donated items for Seeing Eye Dogs, elementary school art supplies, and first aid kits for first responders. For more details visit the information page at aMAZEing Builders. If you happen to be new to our website, and you are looking for new team building ideas, make sure to visit our main event page at https://www.leadersinstitute.com/team-building. Also, if you are looking for fun games or ice-breakers, make sure to visit our Resource Center. We offer a lot of free activities that you are welcome to add to your own meetings to make them more fun. Finally, if you’d like information about any of the above programs, click the appropriate links above. Alternatively, feel free to complete the web form below, and one of our instructors will be happy to contact you!